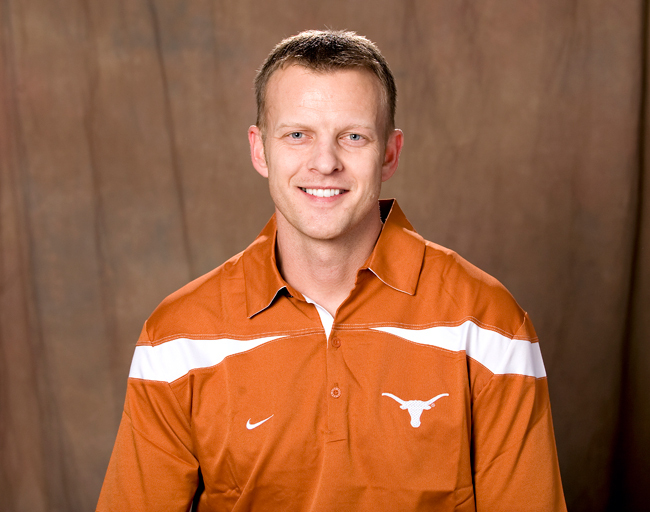 Former Longohrns offensive coordinator Bryan Harsin has officially been named the head coach at Arkansas State, Texas announced Wedensday afternoon. With Harsin's departure, Major Applewhite will retain his title as co-offensive coordinator and will now assume the playcalling duties while wide receivers coach Darrell Wyatt has been promoted to co-offensive coordinator. Among the other staff changes are Stacy Searels' move from offensive line coach to assistant head coach for offense. With the promotion of Wyatt, who tight ends coach Bruce Chambers split recruiting duties with, Chambers will now handle the recruiting responsibilities on his own. Texas also announced that it will begin looking for a running backs coach, a role that Applewhite had while serving as co-offensive coordinator for the last two seasons. "[Bryan] has done a tremendous job fo us, and we appreciate all the energy he's poured into our program the past two seasons," Longhorns head coach Mack Brown said in a statement. "He's a bright young head coach with great enthusiasm and passion for the kids and the game. He'll do a tremendous job at Arkansas State. Because of the great support and resources [men's athletics director] DeLoss Dodds, [UT president] Bill Powers and The University of Texas provide us, our coaches are well compensated and in a position that they can focus all of their energy on our program and be patient when it comes to future opportunitites. We're excited for Bryan because after visiting with the folks at Arkansas State, he feels like it is a great situation for him. We're happy any time our coaches have the opportunity to be a head coach. I think that is a great reflection of the types of coaches we are fortunate enough to have in our program." Applewhite, who left Texas as its all-time leading passer in 2002, was a graduate assistant for the Longhorns from 2003-04. 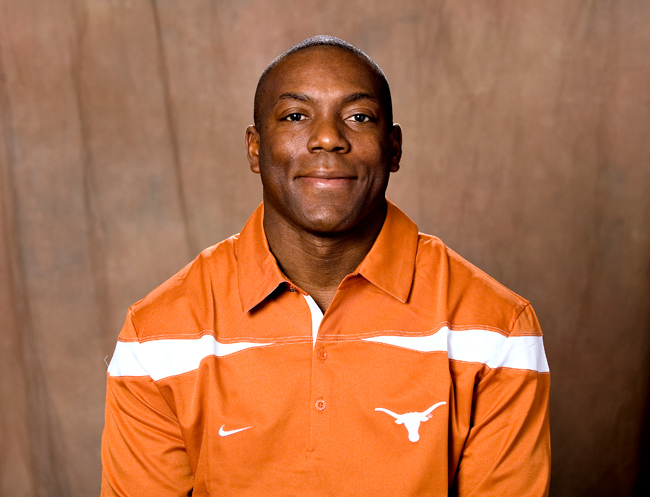 After spending a year as the quarterbacks coach at Syracuse (2005), Rice (2006), and Alabama (2007), he returned to Texas to serve as the running backs coach. In 2010, he was promoted to co-offensive coordinator following the departure of Greg Davis. He'll make his playcalling debut when the Longhorns take on Oregon State in the Valero Alamo Bowl on Dec. 29. After a disappointing 5-7 season two years ago Mack Brown cleaned house, but his new assistants have kept ties with this year's recruits. When Stacy Searels first set foot on the field at Darrell K Royal-Texas Memorial Stadium, he was in awe. Searels, Georgia’s offensive line coach at the time, eventually took the same position at Texas. An All-American offensive lineman at Auburn, Searels became one of the six new coaches Mack Brown hired last January. Another one of them, co-offensive coordinator Bryan Harsin, had a similar situation when he was introduced to the Longhorns’ 88 year-old football stadium. The Longhorns signed one of the nation’s best recruiting classes Wednesday and have assistants like Harsin and Searels to thank. While Harsin, Searels, defensive coordinator Manny Diaz, wide receivers coach Darrell Wyatt and defensive tackles coach Bo Davis had not been in Austin for a month before last year’s Signing Day, they were instrumental in assembling one of the country’s finest recruiting class. All but one of 23 members of Texas’ recruiting class of 2011 committed to play for the Longhorns before they went 5-7 and lost two-thirds of their coaching staff. But despite the fact Brown was hiring coaches in the weeks leading up to Signing Day a year ago, he signed all of the players that made verbal commitments to Texas except Chandler, Ariz. native and five-star offensive tackle Christian Westerman. The Longhorns went on to play 17 true freshmen last season, more than any team in the nation, including Big 12 Freshman of the Year defensive back Quandre Diggs and Holiday Bowl MVP quarterback David Ash. Rookie running backs Malcolm Brown and Joe Bergeron combined to rush for more than 1,200 yards despite each missing three games due to injuries. Freshman left tackle Josh Cochran took over midseason for Tray Allen, one of the country’s top offensive tackle prospects five years ago. With Texas not having to piece its coaching staff back together, the Longhorns used its newfound stability to reel in a superb recruiting class this year. Brown’s assistants, especially Searels and Davis, were crucial to picking up prospects such as Torshiro Davis, once committed to LSU, but who signed with Texas. The four-star linebacker from Shreveport had known Bo Davis since his days coaching at Alabama. Searels also helped the Longhorns steal away a recruit from the SEC when Van High School linebacker Dalton Santos, who Searels had his eye on since he was at Georgia, committed. Brown said that Searels nabbed all of the offensive linemen he was targeting, including junior college transfer Donald Hawkins. Davis also attracted a junior college player to Texas in 6-foot-6-inch, 335-pound defensive tackle Brandon Moore. “I’m really impressed with Stacy and Bo and what they’re doing for our line of scrimmage,” Brown said. After helping the Longhorns sign yet another outstanding recruiting class, Davis has an excellent chance to be part of a national title-winning team at Texas. Center Dominic Espinosa (55) opens a hole for running back Joe Bergeron (24) to run through. Espinosa has started every game this year. Like most of the team, it went through many changes. Texas hired Georgia’s Stacy Searels to coach the offensive line this January. True freshman Dominic Espinosa has started at center since the first snap of the season opener. Senior David Snow, who started all 12 games at center last year, moved over to left guard. Another freshman, Josh Cochran, replaced senior Tray Allen as the Longhorns’ starting left tackle and backup guard Luke Poehlmann has made his presence felt at tight end. So far, the moves have paid off. The offensive line was highly criticized last year as Texas averaged just 23.8 points per game and Garrett Gilbert threw more interceptions than touchdown passes. No Longhorns running back topped 600 yards rushing in 2010 but they have three — Malcolm Brown, Joe Bergeron and Fozzy Whittaker — on pace to do that this year. One of the biggest reasons for the transformation up front has been the new leadership Searels has provided. Like Texas’ last three defensive coordinators, Searels, a two-time All-SEC selection at Auburn, came from the SEC to Austin. Searels, who coached at Georgia for three years and was in charge of LSU’s offensive line when the Tigers captured the 2004 national title, has worked wonders with Texas’ offensive line this season. Like Searels, Malcolm Brown and Bergeron weren’t a part of the Longhorns program last year when Texas tried and failed to install an effective rushing attack. But the freshman tailbacks have resurrected the dormant running game this year, already combining to run for more than 1,000 yards. Brown and Bergeron are not the only first-year players making contributions to the drastically improved run game. Cochran, whose Hallsville team went 4-6 in his senior year of high school last season, has done his part to make sure Texas doesn’t have a similar year again. Poehlmann, a fourth-year junior, is a seasoned veteran compared to players like Cochran but is helping the Texas offense in new ways, too. The junior offensive guard moved over to tight end against Kansas and it hasn’t been a coincidence that the Longhorns’ two most productive offensive outings have come with Poehlmann opening up holes on the edge of the offensive line. “The O-line is doing a great job,” Whittaker said. “When you look into their eyes, you can tell that they’re focused and ready to push them off the ball no matter what kind of play it is. When Whittaker is asked something, he almost always finds a way to work in the phrase “got to give credit to the offensive line” into his response. Not bad for a group that was considered a liability a year ago. When Dominic Espinosa finally got his chance to shine, he didn’t disappoint. Espinosa has been a nice surprise for the Longhorns coming out of fall camp, and the redshirt freshman impressed the coaches enough to earn the starting nod at center for the season-opener against Rice. A local product from Cedar Park, Espinosa sat out his first year at Texas and then missed spring practice with an injured shoulder, which required surgery. This August, Espinosa fought his way into the starting five and solidified an O-line that took a step backwards in 2010, when the Longhorns averaged a paltry 150.2 rushing yards per game. Texas was thin along the offensive line during spring ball, and first-year O-line coach Stacy Searels didn’t have a lot to work with. But with Espinosa healthy by the time fall camp got underway, the former prep All-American wasted no time making a name for himself. Espinosa was a heralded recruit when he first arrived on campus, but shoulder problems derailed his development. Now, though, Espinosa will anchor the offensive line. “He was a great recruited offensive lineman so after he got over his injuries it was time for him to step up and play,” said senior left tackle Tray Allen. To make room for Espinosa on the first team, senior lineman David Snow moved from center to left guard. Snow started all 12 games at center a year ago. Although the freshman replaced the senior, Snow says he’s comfortable handing off the center spot to Espinosa, who has been lauded by the coaching staff and his teammates for his high football IQ. Espinosa has embraced Searels’ smash-mouth philosophy and has held his own in one-on-one drills against the defensive linemen in fall camp. Espinosa routinely goes against senior defensive tackle Kheeston Randall. “That’s great practice [for him]; you get no better reps than those one-on-ones,” Randall said. “He’s a shorter center, but that gives him more leverage. Though Espinosa has turned heads with his play so far, having a veteran group of linemen has helped the young center’s development. He made the most of his redshirt season too, soaking up all he could in the film room and on the scout team. So, is Whittaker concerned about the freshman being able to open holes from the Longhorns’ tailbacks? Texas’ motto this offseason has been a brick-by-brick approach to rebuilding the team coming off a 5-7 season. The offensive line needs rebuilding too, with only two returning starters. The Longhorns — and the O-line — will lay the first brick on the road to redemption down on Saturday night against the Owls. Espinosa waited a year for his chance to shine. His moment is finally here. Texas hopes its offensive line will be better than last year, when it struggled to open up holes in the running game and give quarterback Garrett Gilbert protection. New line coach Stacy Searels is trying to establish a more physical mentality. The Longhorns offensive line is out to prove one thing this season — their toughness. Many considered the O-line to be soft after a poor showing in 2010, the result of a nonexistent running game and an increase in sacks allowed. But with new offensive line coach Stacy Searels, who joined the Texas staff this offseason after spending his last four years at Georgia, the Longhorns have taken on a new mentality up front. “It’s all about smashing you in the mouth and moving quickly to get there,” said senior left guard David Snow. Searels is an imposing figure on the practice field, standing 6-feet-6-inches and weighing over 280 pounds, and brings a tougher, meaner and nastier edge to his new squad. Senior left tackle Tray Allen said the linemen talked about being a punishing group after the Longhorns loss to Texas A&M on Thanksgiving, and they’ve been striving for that persona ever since. “Being a tougher offensive line is what we’ve been working on and hopefully we show everybody on [Saturday],” Allen said. The Longhorns admit they were complacent a year ago, after coming off back-to-back trips to BCS bowl games. With Searels in the fold, though, that’s unlikely to be the case in 2011. “He’s going to make practice as hard as he can [to prepare] for game situations,” Snow said. “He’s going to push you throughout the whole practice. Gone are the days of zone blocking schemes and lateral running plays. Searels has Texas blocking downhill this year, a return to the philosophy that preceded the spread offense. Now, the Longhorns’ mentality is to come right at the defense, a change that Searels instituted on the first day of camp. 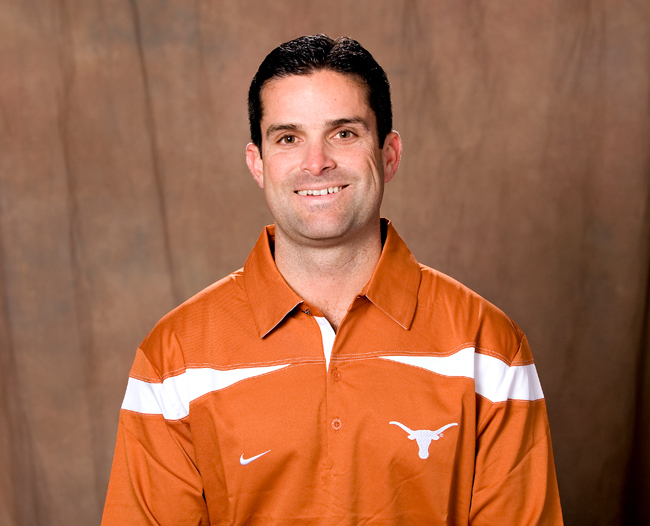 Searels is one of six new Longhorns coaches this year. Despite all the new faces on the staff, head coach Mack Brown says he’s been pleased with the way the group has meshed. So far, Searels has put his stamp on the offensive line and settled on a starting five. Now it’s up to him to identify the backups. Whoever the top 10 linemen will be, one thing is certain: Searels won’t tolerate softness. Come Saturday, he’ll find out just who has the toughness to restore Texas to prominence. After one of the most tumultuous offseasons in recent memory, Texas finally has its coaching staff in place. While some expected the Longhorns and head coach Mack Brown to rapidly fill the vacancies on staff, they instead took their time, handpicked their guys and only finished the hires last week. Seven new faces will pace the sidelines next year at Texas and here’s a look at some of them. Will Muschamp shocked the Longhorn nation by bolting for Florida in December, leaving fans and recruits wondering what would be next. Diaz was the biggest hire and the very first Mack locked down. He has only one year of experience as defensive coordinator of a BCS school, but his Mississippi State Bulldogs finished third in the SEC in scoring defense last season and fourth in rushing defense. Diaz likes to show opposing quarterbacks mixed looks, which should work well in a pass-heavy league such as the Big 12. Diaz might not show as much energy as Muschamp on the sideline, but his results should be as good, if not better. Major Applewhite was the biggest surprise. It was rumored that Applewhite would follow Muschamp to Florida to become the offensive coordinator, but it seems Applewhite’s ties to Texas were too deep. The former Texas quarterback gets the co-offensive coordinator tag slapped on to go with his promotion after working with the team’s running backs for the past three seasons. He and Bryan Harsin will combine to improve an offense that only managed 24 points per game, and develop junior quarterback Garrett Gilbert, who struggled during his first year as a starter. 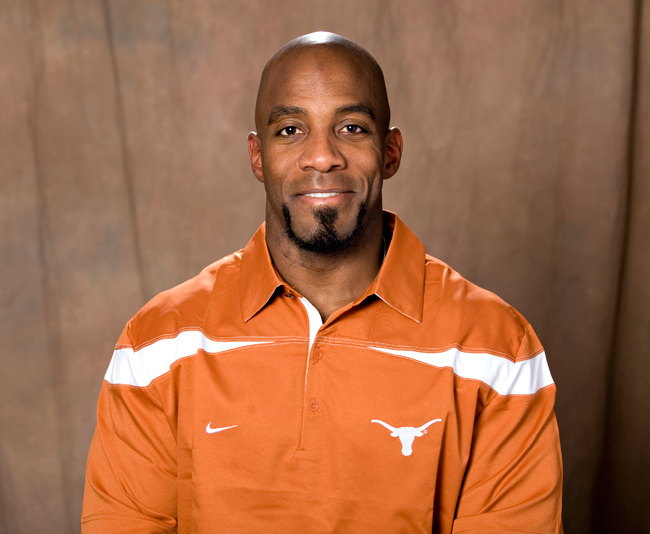 Mack’s most underrated hire this offseason had to be former Longhorn cornerback Jerry Gray as defensive backs coach, who returns to the college ranks after coaching in the NFL for 15 years. Adding someone with NFL experience helps recruiting immensely, and Gray’s experience with Texas — he grew up in Lubbock and coached at SMU — will add to the Longhorns’ recruiting prowess. Gray will be a hit with the players and should help add to the play in the secondary that over the years has garnered Texas the nickname DB University. Searels replaces Mac McWhorter as offensive line coach and was a last-ditch hire. Searels was the final member of the staff to be hired and hasn’t been in Austin for more than a week. Texas was pursuing Auburn offensive line coach Jeff Grimes, but couldn’t lure him away from the Tigers. In turn, top offensive line recruit Christian Westerman selected Auburn over the Longhorns. Still, Searels develops good relationships with his players and comes from a great coaching pedigree in the SEC, having coached four years at Georgia and won a national championship with LSU. Stacy Searels isn’t a man who likes a lot of change. Growing up in Georgia, he lived in the same house for 18 years — even the furniture didn’t change. But when Mack Brown called last week to fill a vacant spot on his coaching staff, Searels couldn’t pass up the chance to come to Texas and change one more time. “It is a slam dunk to be here at Texas,” Searels said. Searels spent the past three seasons as the offensive line coach at Georgia, and will serve in the same capacity at Texas. But the move wasn’t easy for Searels, who has coached in the SEC since 2003. It was hard for him to leave the people he’d formed friendships with, especially the players he’d coached. Searels called every recruit committed to Georgia, telling them how hard it was to leave. He also called every player he’d ever coached on the Georgia offensive line. Searels’ first task as offensive line coach will be recruiting. National signing day is Feb. 3, and the Longhorns’ recruiting class took a hit Friday with the de-commitment of top-ranked offensive lineman Christian Westerman. Searels has experience with recruiting nationally, but believes Texas can serve as an adequate ground for recruiting. Mack Brown finally found his man. 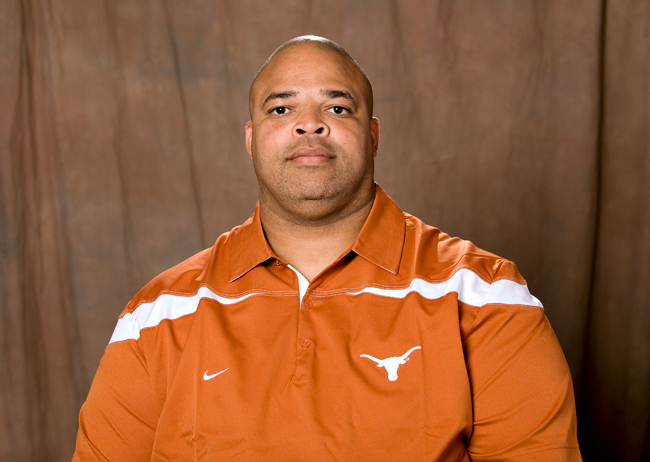 Texas filled its final coaching staff vacancy yesterday, naming Stacy Searels as offensive line coach. Searels spent the past three seasons as the offensive line coach for Georgia. Searels replaces Mac McWhorter, who retired in December after seven seasons at Texas. 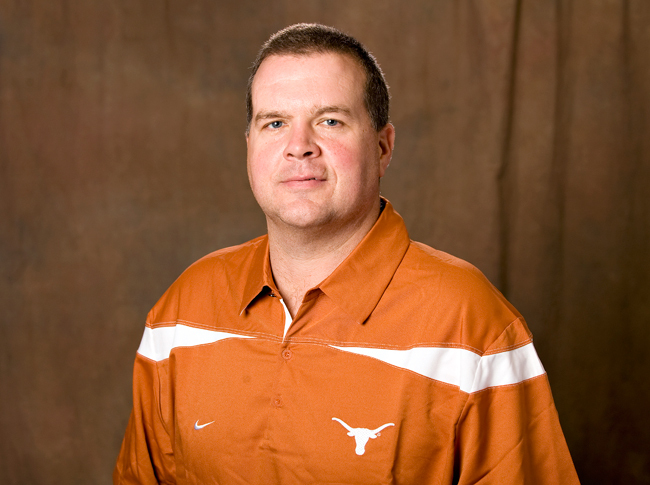 Searels brings a great pedigree and a wealth of knowledge about the offensive line to Texas. Before coaching at Georgia, Searels served as the offensive line coach for LSU from 2003-2006, where he won a national championship in 2003. While at LSU, Searels coached two All-American offensive linemen and five that went on to make NFL rosters. In his playing days, Searels was a three-year starter as an offensive lineman at Auburn. He blocked for Heisman Trophy winner Bo Jackson in 1986 and earned First Team All-America honors as a senior in 1987. While he may have started his college football career in the SEC, Searels said the talent and leadership at Texas was what tempted him to stray.